Winning is a brand used by virtually every well-known pro in Boxing and even some pros in MMA. Winning is the pinnacle of gear, the brand that other brands try to copy, the brand at the very top of the food chain. I’ve had my Winning MS-500 gloves for over a month and I’ve been using them almost every day since the day I got them. Before these gloves came along I was using the Hayabusa Tokushus and the Ring to Cage C17s for bag work. I got The MS-500 for two main reasons. The first to see if Winning really is as good as they say and the second to see if Winning could replace my C17s and Tokushus. Winning uses a layered padding for their gloves. Aside from Winnings prowess as the greatest brand, their gloves are also known to be, “pillows.” That being said though Winning padding has become without a doubt my favorite type of padding. It’s soft, it’s inviting, and it’s fully broken in. It’s very comfortable and it feels as though it shapes to your hand, as if it was specifically made for your hand. For example comparing it to IMF padding, IMF makes my knuckles sore. It’s firm, it doesn’t allow you to fully open your hand, it doesn’t shape to your hand. IMF gives you a shape and makes you deal with it. Winning is soft, straight out the box the glove comes broken in. You can put the gloves on and fully open your hand. The very same day you get them you can go out and spar without worrying about hurting your sparring partner with rock solid padding. No break in period whatsoever for these things. The protection they offer is hands down the best of any glove. For practically every glove I’ve used I’ve managed to throw a good enough punch and punch through the padding. For example the C17s, excellent gloves and also 16oz gloves. After throwing a good left hook I felt almost every knuckle connect on the bag. Keep in mind these C17s are supposed to have almost identical padding to Winning. Now my MS-500s are only 14oz and no matter how hard I try I haven’t been able to punch through the padding. On another note I also use less wraps for my knuckles when I use my MS-500s because the hand compartment is snug. One last time to further emphasize the protective qualities of these gloves, less knuckle wraps, less glove weight, and still have not been able to punch through these Winnings. The wrist support of the Winnings also beats almost every boxing glove. I have bad wrists so it’s easy for me to hurt them. Usually for me the best way to test wrist support of a glove is through hooks, specifically the left hook. As a comparison for my 16oz velcro C17s I needed a wrist pad to add support so I wouldn’t hurt my wrists. My Tokushus were the only gloves where I could throw hard hooks continuously with no fear of hurting my wrists. That is until I got the MS-500s. I can really sit on my punches and throw them as hard as I can on the bag with absolutely no fear of pain. The MS-500s offer incredible wrist support. Also a thing to keep in mind is that I use elastic laces for these gloves and I keep them loose so I can slip them on and off easily. Even with the loose and stretchy laces my wrists still have incredible support from these gloves. Overall the protection and padding is amazing and without a doubt my favorite of any glove. Like I said their padding is my favorite and I consider it the best padding for any situation but specifically sparring because not only does it protect your hands but it also protects your sparring partner. That being said, the padding can be used for ANYTHING from sparring, to mitts, to bag work. They offer the best all-around protection from hands, to knuckles, to wrist. 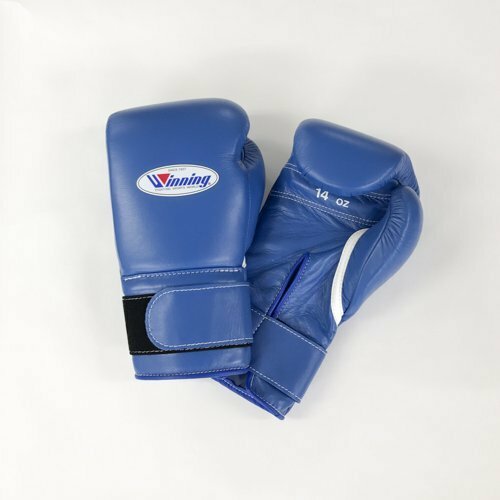 There’s a reason the pros use Winning boxing gloves while training. Part of the reason as to why my Winnings have become my go to gloves are because of their comfort. To further explain and give a little insight let me mention my other main gloves. I used some C17s for sparring because the padding was very similar to Winning. I got the Tokushus because I heard their protection is incredible especially the wrist. These were my bag gloves for a while but the problem they had was that the thumb positioning made my hands cramp up quick. I got the C17s to fix this but I was able to punch through the padding so I traded comfort for protection. Once I got the MS-500 I had the best of both worlds. Over all the glove is very comfortable. The hand compartment is a little snug, a little tight and that’s something I’m not a huge fan of, but even so the gloves still feel amazing. The Winning thumb is one of its signature aspects. Winning uses a straight thumb for their gloves and that straight thumb allows you to make an ideal fist. It has become my favorite type of thumb and like I said before this is one reason why the gloves became my go to gloves. Because of the thumb, because of the glove style overall, my hands never cramp up or get tired. The liner Winning uses is also top notch. It’s a very soft nylon liner. Between rounds, during breaks, I usually scratch the liner with the tip of my fingers because of how soft it feels. The liner and the padding make for a very pleasant cushion. Winning is without a doubt the most comfortable glove I own. As I stated earlier, my hands never cramp up, they never get tired, and they never even remotely hurt. Every aspect works well together, from the padding, to the liner, to the thumb, even the leather, everything makes for a very enjoyable glove. Winning uses the highest quality materials. For example their leather rivals that of Cleto Reyes’ leather one leather which is known to outlast its own padding. Winnings leather is very eye catching, ANY color will catch your attention. Personally I wanted black gloves to match my black FG2900 but they were out of stock so I went with blue. At first I was a little disappointed but when I opened the box I instantly loved the look. I did find a very small blemish in my leather though. On the cuff there’s a very very small piece that seems to have been scratched. It’s not a big deal and it doesn’t hurt the glove in any way but it was rather surprising and sad to find an error like that in the Winning boxing gloves. Winning also has the cleanest stitching of any brand that I’ve ever seen. Every little stitch is perfect, the stitching is very straight and tight, it’s even pleasing to the eye. The palm side stitching adds to the overall clean design of the glove. That being said though I do have too loose ends on a glove. Again doesn’t hurt the glove at all but really sort of disappointing to find something like that in Winning gear. Like I’ve said though, these are the closest thing to perfection. The durability of these things is incredible. I’ve only them for a gloves but by comparing them to my other gloves it’s clear to see who will outlast who. For example after just a month of using my Ring to Cage C17s I found some bubbling of the foam. Yet my MS-500s look as good, as clean, as shiny, and as beautiful as the day I got them. They even have the same strong leather smell and none of the stitching has been messed up no matter how many rounds I’ve put into them. As further example of their durability there are various professional boxers whose Winnings are practically ancient but they continue to use them because the padding and leather hasn’t broken down yet. Like I’ve mentioned before these gloves are beautiful, they are literally a work of art. Out of all of my gear I take the most care of my Winning FG2900 and MS-500s because I don’t want to see even the slightest mark on them. The design of these gloves is just so clean and perfect. They’re slim, trim, everything from the overall shape, to the thumb, the double cuff, and even the stitching, everything makes the glove look incredible. Like I said earlier, I didn’t even want the blue versions but I went with them because everything else was out of stock. Yet the gloves grew on me instantly. Such a vibrant color, such a soft leather. Even the liner looks incredible on these gloves. If you look on the inside the blue liner literally looks like soft blue waves. Everything about these gloves is inviting, they make you want to use them. Hands down my favorite design of any glove. When it comes to looks though their stock velcro doesn’t look too good. The velcro closure doesn’t hurt the performance or protection but it just looks strange and out of place because of it’s size. It’s a rather flimsy velcro strap that just does not suit the glove. If you go with velcro I recommend ordering custom and asking for a three to four inch velcro closure because not only will it look better but it’ll also offer more wrist support. This is the main deal breaker for most. These gloves range from $198-$250+ for stock colors depending on where you get them. Custom gloves go past $300. Now the real question is, are they worth it? I’d have to say yes they are. Honestly it was sad to see all that money leave my wallet but when I got my gloves they made up for it instantly. These gloves without a doubt are worth the price. You get the closest thing to perfection and perfection doesn’t come cheap. If these gloves cost $100 then you wouldn’t get the beautiful soft leather, you wouldn’t get the almost perfect stitching, you wouldn’t get that insane longevity, you wouldn’t get the qualities that Winning is known for. With that being said I understand paying $200+ for gloves isn’t ideal but I hope everyone understands that you won’t be ripped off if you do take the plunge. I haven't used any glove that can rival my MS-500s. Winning found a way to design and create the most perfect glove. From the beautiful look to the incredible performance these gloves really are just perfection. There is no glove that will protect your hand better than a Winning and there is also no glove that will give you this much comfort. Lobo purchased this pair of Winning gloves himself for the full price. This did not influence the outcome of this review.